Eircom eVision 191 and other free to air boxes. A repeat will also be available on Sky channel 191 on the following Tuesday at 1.30pm and also Thursday at 11pm. 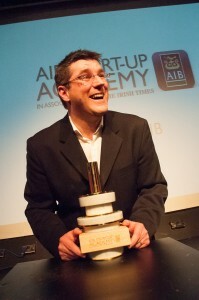 We meet the people behind the scenes as Herdwatch has been named as the first ever winner of AIB’s Start Up Academy with a prize package of €250, 000. 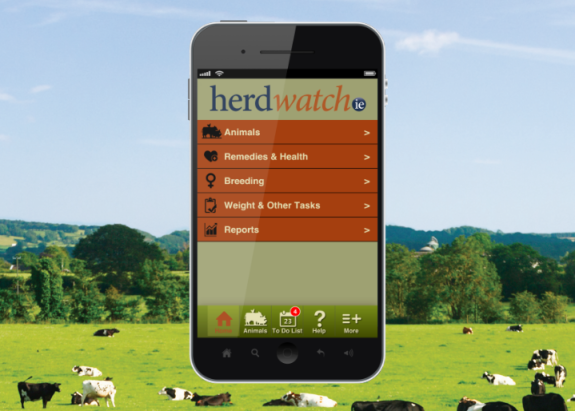 Herdwatch farming app & software package gives dairy & beef cattle farmers’ easy compliance & valuable farm records, anytime, anywhere. Tony O’Connor an international award winning equine artist presents his April Foals exhibition at the South Tipperary Arts Centre, Clonmel. Tony’s work highlights the power, beauty and elegance of the horse anatomy. Fracture Youth Theatre group are taking you outside the theatre to experience their intimate show ‘Back Seat’,from the back seat of a car. This is a unique theatrical treat that is bound to please its limited audience at The Source Arts Centre Carpark. Experienced Diary workers wanted in Kerry. Experienced dairy workers required for permanent and temporary full time work for Relief Milking &General Farm work in Kerry area. Applicants must be competent stockpeople and experienced in all aspects of dairying including using full range of farm machinery. Or Phone Kerry FRS for details on 0667141099. 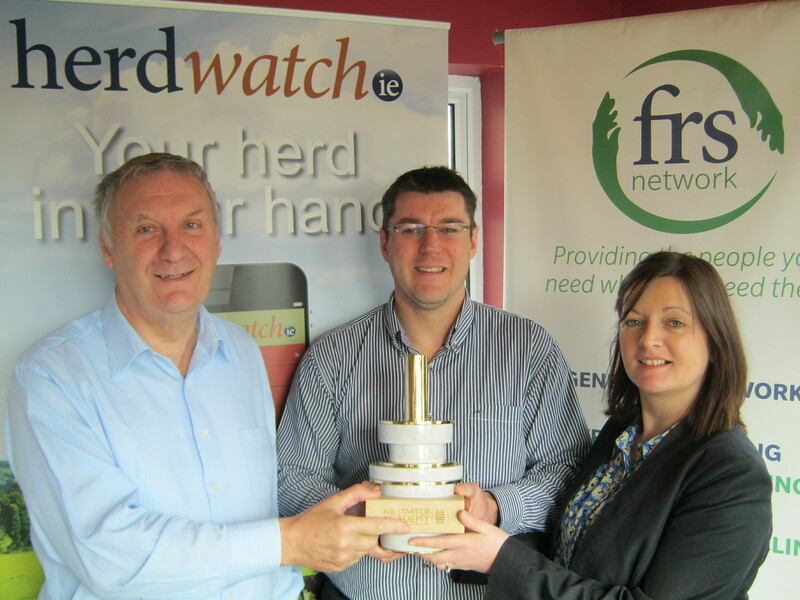 Herdwatch, is the Special Category Award Winner for Technology at the National Enterprise Awards County Competition held at Brú Ború, Cashel last week. 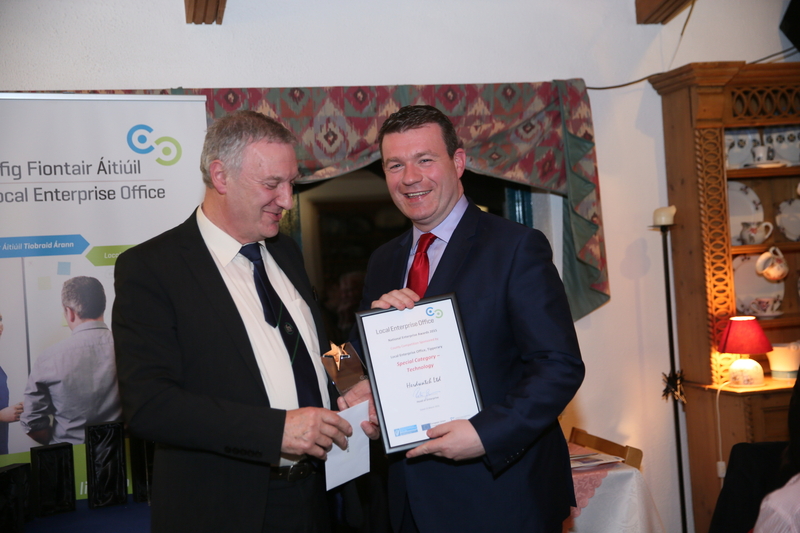 Pictured L-R Peter Byrne, FRS Network and Herdwatch , Roscrea and Minister Alan Kelly, TD, Minister for the Environment, Community & Local Government. Herdwatch, our mobile App for farmers, has won the first ever AIB Startup Academy. We are absolutely delighted and grateful to AIB, The Irish Times and all partners of this wonderful competition with a prize package worth €250,000! The competition was very tough with 300 applicants, reduced to 20, then 11 for the 8-week long Academy programme. All 11 finalists presented high quality and passionate pitches for the final, and Herdwatch came out on top and is flying the flag high for Irish Agri Technology! The hard work of the dedicated FRS Herdwatch team has paid off and we are looking ahead to a very busy time. Thank you to the hundreds of farmers who have already signed up to Herdwatch. Photo: (L to R) Peter Byrne, FRS Network CEO, Fabien Peyaud, Herdwatch and Jane Marks, FRS Network Marketing Manager back at base in Tipperary with the trophy. 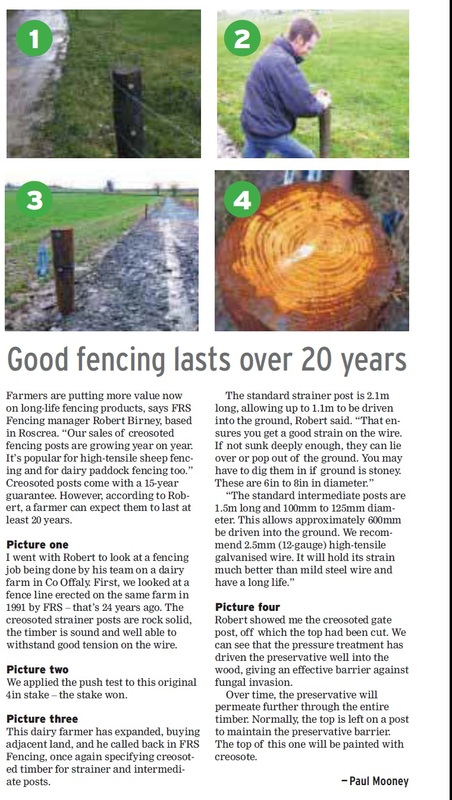 Great article on fencing by Paul Mooney of the Irish Farmers Journal today. Quality wins every time. Good Fencing Lasts 20 years. Farmers are putting more value now on long- life fencing products. Read complete Farmers Journal article here. New* List of Vacancies for Farm Work in the Offaly, Tipperary, Laois Areas. To Apply Contact Kate on 0505 21166 in the Roscrea FRS Office or visit website to apply online today. Farm Workers Required in Dromahane / Bweeng areas of North Cork. Experience required in Milking, Calf Rearing, Tractor work and general animal Husbandry. Full time, Part time and am/pm positions available. Click HERE to fill out application form and e-mail it to mcarroll@frsnetwork.ie . Phone 029 50750 and 087 9828750 for more information. The 7th All-Ireland final of the FRS Memorial Scholarship took place at the Teagasc / Macra na Feirme Colleges Challenge Day in Mountbellew Agricultural College, Co. Galway last week (21st January). Scholarship winner, Martin Hoade from Tuam, was representing Mountbellew Agricultural College. The scholarship is run in conjunction with Macra na Feirme and a winner is selected to represent each Teagasc college as a national finalist. In the national final, Martin gave his winning presentation on Dr. Edmond Harty, Dairymaster, a leader he admired, to a judging panel made up of Mike Clarke FRS, Kieran O’ Dowd, Macra na Feirme, and Frank Murphy, Teagasc. Involved in the home dairy enterprise at eighteen years of age and with a big interest in cars, Martin will be busy as he takes up the scholarship. 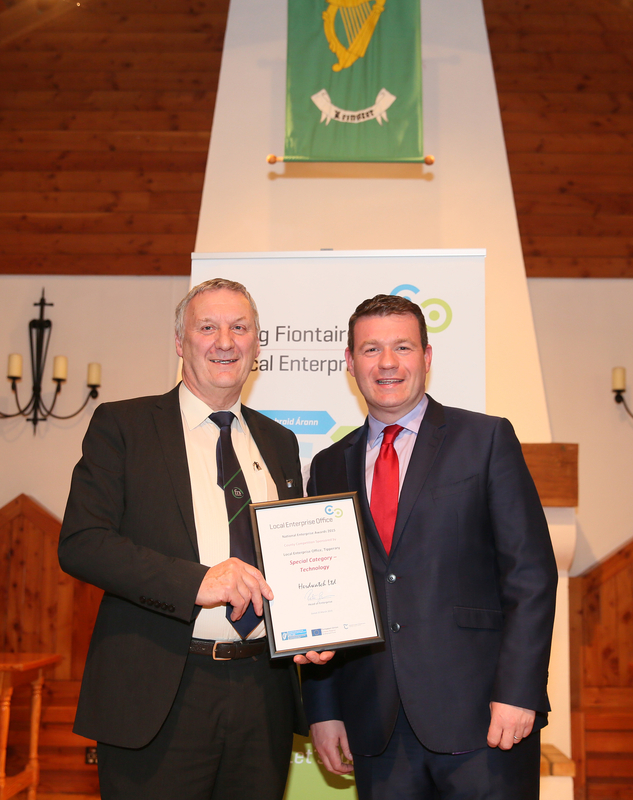 Winning first prize means Martin will spend the three months after he finishes in Mountbellew gaining experience in all aspects of the Farm Relief Services business in their local office. 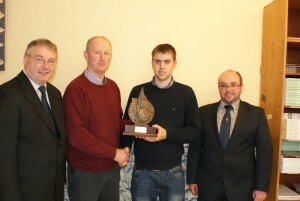 Martin Hoade, winner of the FRS Memorial Scholarship, pictured receiving his trophy from Frank Murphy, Teagasc; Michael Clarke, FRS; and President of Macra na Feirme, Kieran O’Dowd. We have announced the creation of 80 agricultural advisor jobs nationwide for the rollout of the GLAS planning and support service to Teagasc farmer clients in 2015. There will also be a number of administration roles. FRS are now accepting applications from experienced advisors and recent graduates for these roles which will involve providing farmers with GLAS planning services, nutrient and sustainable management plans and meeting farmers on farm and in Teagasc offices. Applicants are required to have a HETAC Level 8 degree in Agricultural Science, or Land Management with Soil Science and Crop Production, or Animal Production, those with similar degrees may also be considered. Familiarity with, and experience of, a variety of farm production systems and a full clean driving licence with access to own transport are essential. Work will involve the preparation of agri-environmental plans in compliance with the GLAS scheme which is anticipated to commence in early 2015. 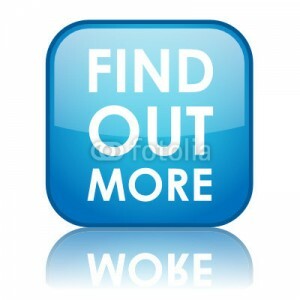 CV’s should be e-mailed to glascareers@frsnetwork.ie Visit www.frsnetwork.ie/careers for further details.